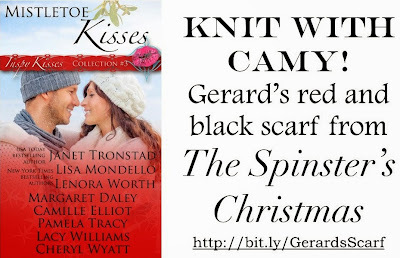 I’m going to knit my hero’s scarf from “The Spinster’s Christmas,” my new Regency romance short novel that will be included in the upcoming Inspy Kisses anthology, Mistletoe Kisses. The pattern is very simple, but the challenge is that I’ll be using an antique knitting pattern published in 1837, updating it in modern language. Want to join me? Head over to the Regency Reflections blog to hear all about it! The Mistletoe Kisses anthology is eight authors writing contemporary romance, historical romance, and romantic suspense novellas for only $0.99 cents! But the sale is ONLY UNTIL NOVEMBER 30TH so pre-order yours today!